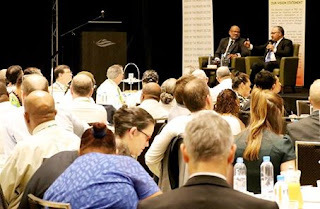 Papua New Guinea Prime Minister Peter O'Neill said political stability is vital for the growth of the country. While speaking during the Business Council of Papua New Guinea meeting, he said, "A very important factor in growth is that business community needs stability. After decades where Governments changed every few years, and business never knew who would be in office one year after the next, that has all changed. Over the past fifteen years, there has only been two Prime Ministers. This is unprecedented in our country. There are not many countries in the world who are able to maintain that level continuity in Government. Now moving into the seventh year after our Government first came to office in August 2011, we will continue to deliver stability that the business community wants. We know that maintaining political stability is key element in maintaining business confidence"
The concerns that confront business today are known to our Government. We know that business wants to know how Government is addressing the availability of foreign exchange. I understand the genuine concerns you have, and the impact that the availability of FOREX has on your businesses. The Bank of Papua New Guinea continues to have our full confidence, and I believe, that they are managing this issue responsibly. The Central Bank's intervention in the foreign exchange market has been sensible. Foreign Reserves are currently sufficient for 10 months of total import cover. Our Government hears the concerns that have been raised by business, and we are working to ease these pressures and ensure this issue is attended to in a timely manner. We are also redoubling our efforts to bring online major impact projects in our country. These projects will positively impact foreign exchange reserves, they will also deliver much needed jobs for our people, and reliable contracts for our businesses" he said. Our attention to business engagement and empowerment is from the largest to the smallest businesses. When it comes to large-scale projects, that will generate thousands of new jobs and create new revenue opportunities for our country. Companies, including ExxonMobil, TOTAL and Oil Search, continue to maintain the highest confidence in our oil and gas sector. Other investments are coming online, particularly in the mining sector. The Government is fully committed to these developments, and the number of others at various stages of advancement and approval processes. As we move forward, we also have a renewed focus on being more self-sustaining in manufactured products. As a resource-rich nation, combined with a committed and better trained workforce, we must become more self-reliant. Where we can produce more locally, and we must do so. We will continue to diversify our economic base to create greater opportunity in sectors that include – Agriculture, Tourism, Forestry and Fisheries, to name a few. We need to stop going through the boom and bust cycles. We believe the downstream processing of our raw products offers opportunities to increase employment, and to add significant value to our exports. We must make better use of our food produce to reduce our reliance on imported goods, and to enhance food security in our country. We will widen the scope for manufacturing industries and create employment opportunities, and ensure we keep up with new technologies and access new markets. Over the last 40 years, we have been slow to grow the formal SME Sector. In the coming years we will deliver a comprehensive small business strategy, including the re-introduction of the Stret Pasin Stoa scheme that has been popular with our people" he said.